A pair of homegrown stars will headline a strong field at the upcoming LPGA tournament in South Korea. Ryu So-yeon and Park Sung-hyun, Nos. 1 and 2 in the women's world rankings, will showcase their talent before home fans at the LPGA KEB Hana Bank Championship starting Oct. 12 at Sky 72 Golf & Resort's Ocean Course in Incheon, west of Seoul. In all, nine out of the top-10 players will compete at the tournament, the only LPGA event in South Korea each year. Only the No. 10-ranked Park In-bee will be missing. She announced last week she will sit out the rest of the LPGA season while nursing a back injury. Ryu and Park Sung-hyun have each won a major title in 2017. Ryu has been No. 1 since June 26, while Park, a rookie sensation, is leading the LPGA Tour in money with a little over US$1.9 million, just ahead of Ryu. This has been a monumental season for the two and the rest of the South Korean contingent on the tour. Prior to this week's McKayson New Zealand Women's Open, South Korean players had combined for 13 victories in 26 tournaments, including three of the five majors. Ryu and Park are also competing for the Player of the Year honors. Ryu is currently leading the points race with 150, only three ahead of Lexi Thompson of the United States and 20 more than Park with seven tournaments to go. The lead is far from safe, since players earn 30 points for each victory, 12 points for finishing second and nine points for coming in third, and so forth. Meanwhile, Park has opened a sizable lead in the Rookie of the Year points race. She has 1,333 points, leaving Angel Yin of the United States well back in second place at 559 points. Rookies are awarded 150 points for tour victories, 80 points for runner-up finishes, 75 points for third place and so forth. Park is poised to become the third straight South Korean to win the top rookie prize, after Chun In-gee in 2016 and Kim Sei-young in 2015. Park is battling Thompson for the scoring title too. Thompson is averaging 69.015 strokes per round to lead the tour, with Park trailing at 69.092. Only two rookies, Nancy Lopez in 1978 and Shin Ji-yai in 2009, have won both the money and scoring titles in the same season. Thompson is third in both the world rankings and the money list behind the two South Koreans. She is the 2015 champion of this tournament and will try to pick up her third title of 2017 at Sky 72. 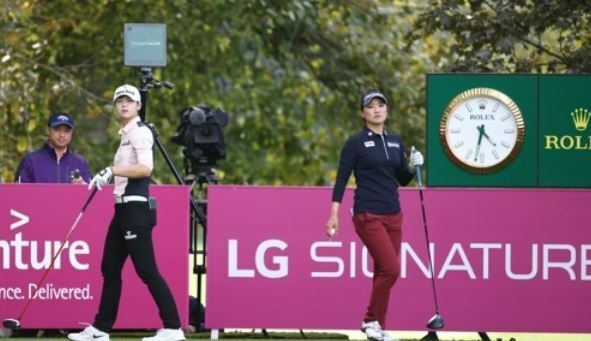 Going up against the LPGA players will be stars from the Korea LPGA Tour, including the top three on the money list: Lee Jeong-eun, Kim Ji-hyun and Ko Jin-young.